This is great news! Maybe NOAA will eventually get quality data that will result in faster charting corrections without having to send Bay Hydro II out to verify..Hopefully, this can also promote accuracy in soundings from on board equipment. Too many vessels have no installation compensation for transducer depth, and too many vessels are compensated for depths below the keel. Neither method contributes to accurate soundings for this type of effort. I would strongly urge that some mention be made both at Rose Point and at NOAA that readings should meet a standard that reflects water depth. Obviously, data can be compensated for location, date, and time to correct for tidal height, but there is no way that data can be corrected for some abstract “depth below my keel”, or depth below transducer. Here on the West Coast, it may not seem to be a big issue, but it’s critical in areas like the Atlantic Intra-coastal Waterway. Too many times I’ve heard depths reported over the VHF as ” 2 feet under my keel” or similar when the water depths in the area may not be more than 12 feet. It’s easy to calibrate your sounder. If there’s a good bottom at your slip, like sand, just tie a string to a weight, drop it to the bottom near the placement of the transducer, and mark the waterline on the string. Measure that length and adjust the offset in the sounder set-up until the depth reading matches the measured water depth. The more often you do that in different locations, the better. Clearly, dropping a small lead fishing weight into soft mud will not give good results, nor will a grassy bottom be ideal. Another issue is that the true draft of a vessel is oftentimes not accurate in manuals and brochures. I usually measure the waterline draft of any vessel I run when it is hauled out, and have found many discrepancies for draft, LOA, and beam from the advertised specs. 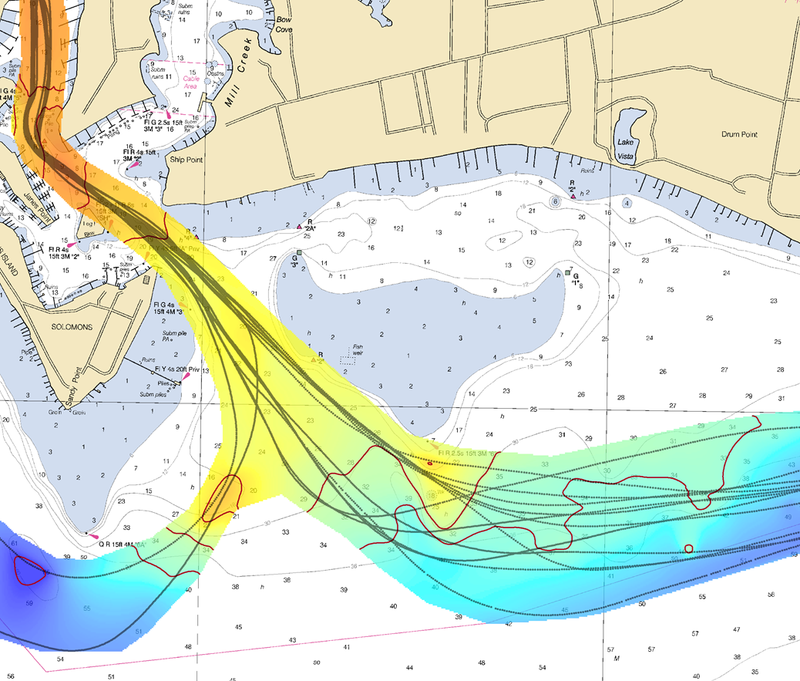 This a big leap forward in helping to improve chart accuracy, Some charting software vendors will be adding the ability for boaters to enable the saving of GPS and depth information into a database – the data is anonymous with no boat specific identification information. But the data will be used to help find areas where the charted depth is not the same as what boaters are seeing, NOAA can then send a survey party out to survey the area and correct the chart.